What began as a lark to sell a few caramel apples at a school fair six years ago has turned into a thriving business enterprise that could bring Lori Carson’s gooey creations to people across the country. 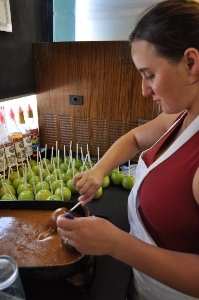 Carson’s company — Caramel Creations — was started on a whim when she decided to create a caramel recipe and sell a couple dozen apples at a fair in Newell in 2007. From there, it was a move to a kiosk at Rushmore Mall, then to arrangements to sell her apples in a few specialty shops and mail-order customers in South Dakota and other Midwestern states. And now, after numerous struggles along the way and a steep, sometimes painful learning curve, Carson is ready to really break through. She’s opening a coffee shop and deli in Black Hawk on July 12; she has licensed her recipe to a major player in the pre-packaged food industry in Portland, Ore.; and she’s close to finalizing a deal with another businesswoman to open a Caramel Creations in Vegas this fall. “It’s highly likely that this little girl might be going national,” Carson, 49, said recently in a rare moment of outward pride. It’s far more common for Carson to speak in humble tones about her life and career path. She tells of losing her father, who was killed by a drunken driver when she was four. And she looks back on up-and-down times early in life, including some tough relationships and career aspirations that ranged from medical transcriptionist to biology and eventually to food service, where she learned through trial and error. Getting the business to a stable spot was hard, too, she said. Carson says that while her daughter Liz’s recipe for apple pie is the company’s top-selling item, she still hinges her success on the caramel itself, a recipe she developed in advance of the fair in Newell by melding the best parts of several other family recipes. “We’ll use our caramel in everything we can think of,” she said. But the apples are the best around because there are no preservative and yet through careful packaging and storage, they ship well and stay crisp and flavorful for a long while, she said. The myriad of apple flavors – such as chocolate crunch cereal and seasonal versions like Easter-egg apples and spider-web apples at Halloween – have kept customers curious and returning. She said other big-sellers include her caramel-swamped sweet rolls, turtle candies and pies. Carson said she sold 15,000 apples last year alone. Looking back, Carson said she benefited from numerous helping hands, whether it be from Howdy Hobernicht of Whitewood who helped teach her the ropes of supply to restaurateurs who let her borrow space to the two new business connections out West and in Vegas, both of whom she met online while playing Spades on the Internet. “I’m very fortunate because I’ve had a lot of strong people help me,” she said. Now she’s moved from borrowing space to setting up a Limited Liability Company, working with lawyers on the national licensing agreement, signing a three-year lease on her new restaurant and overseeing a family business with five employees. The new Caramel Creations restaurant is located at 6801 Black Hawk Road, Suite 4; the phone number is 605-484-1214. "I wanted to be a door greeter so bad ... so bad," Bebout said. After years of being turned down because of his disability, a local family business Caramel Creations made sure that sweet dream came true. "When I told him about my little family business, he came to me and said I want to work for you and I thought to myself I think this could be perfect and I said well I need somebody to hand out samples so it was just meant to be," said Elizabeth Dill, shop owner. Shad's mother says he has been strong-willed from the beginning. "He said, mom, why do I have to walk? God didn't create everybody to walk and I can go anywhere anybody else can in my wheeler chair and this is hurting me and I said you know what Shad, you don't have to walk. If it's hurting you and you can get around in a wheelchair, that is what you will do," said Fran McCaskey, Shad's mother. Now, it is that same wheelchair with a unique tray attached that will make people's day. "When Shad told me had a job as a door greeter at Caramel Creations, I told him I said you're 45 years old. It's about time you get a job and get out of here and he's like don't say that," McCaskey continued. "So we're just really glad to have Shad here with us. He loves his job and he does such a good job for us, so we're truly blessed," Dill said. With his dream of getting a job now a reality and with a steady paycheck, Shad hopes to wheel his way to another dream, visiting a handicap accessible water park in Texas. Regardless, this young man is already making a splash in Rapid City.